The fuel filler lid must be opened from inside the vehicle by pushing the fuel filler lid opener button located on the driver’s door. If the fuel filler lid will not open because ice has formed around it, tap lightly or push on the lid to break the ice and release the lid. Do not pry on the lid. If necessary, spray around the lid with an approved de-icer fluid (do not use radiator anti-freeze) or move the vehicle to a warm place and allow the ice to melt. 2. 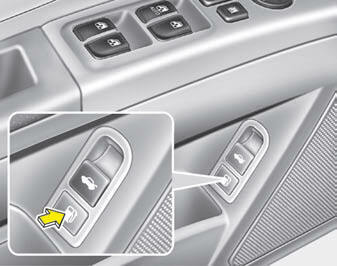 To open the fuel filler lid, push the fuel filler lid opener button. 3. Pull the fuel filler lid (1) out to fully open. 4. 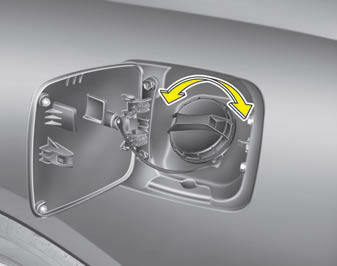 To remove the cap, turn the fuel tank cap (2) counterclockwise. 1. To install the cap, turn it clockwise until it “clicks”. This indicates that the cap is securely tightened. 2. Close the fuel filler lid and push it lightly making sure that it is securely closed. • If pressurized fuel sprays out, it can cover your clothes or skin and thus subject you to the risk of fire and burns. Always remove the fuel cap carefully and slowly. If the cap is venting fuel or if you hear a hissing sound, wait until the condition stops before completely removing the cap. • Do not "top off" after the nozzle automatically shuts off when refueling. • Tighten the cap until it clicks, otherwise the Malfunction Indicator Light will illuminate. • Always check that the fuel cap is installed securely to prevent fuel spillage in the event of an accident. Automotive fuels are flammable materials. When refueling, please note the following guidelines carefully. Failure to follow these guidelines may result in severe personal injury, severe burns or death by fire or explosion. • Read and follow all warnings posted at the gas station facility. • Before refueling, note the location of the Emergency Gasoline Shut-Off, if available, at the gas station facility. • Before touching the fuel nozzle, you should eliminate potentially dangerous static electricity discharge by touching another metal part of the vehicle, a safe distance away from the fuel filler neck, nozzle, or other gas source. • Do not get back into a vehicle once you have begun refueling since you can generate static electricity by touching, rubbing or sliding against any item or fabric (polyester, satin, nylon, etc.) capable of producing static electricity. once again eliminate potentially dangerous static electricity discharge by touching a metal part of the vehicle, away from the fuel filler neck, nozzle or other gasoline source. • When using an approved portable fuel container, be sure to place the container on the ground prior to refueling. Static electricity discharge from the container can ignite fuel vapors causing a fire. Once refueling has begun, contact with the vehicle should be maintained until the filling is complete. Use only approved portable plastic fuel containers designed to carry and store gasoline. ignite fuel vapors causing a fire. • When refueling, always shut the engine off. Sparks produced by electrical components related to the engine can ignite fuel vapors causing a fire. Once refueling is complete, check to make sure the filler cap and filler door are securely closed, before starting the engine. • DO NOT use matches or a lighter and DO NOT SMOKE or leave a lit cigarette in your vehicle while at a gas station especially during refueling. Automotive fuel is highly flammable and can, when ignited, result in fire. • If a fire breaks out during refueling, leave the vicinity of the vehicle, and immediately contact the manager of the gas station and then contact the local fire department. Follow any safety instructions they provide. • Make sure to refuel your vehicle according to the "Fuel requirements" suggested in section 1. • If the fuel filler cap requires replacement, use only a genuine KIA cap or the equivalent specified for your vehicle. An incorrect fuel filler cap can result in a serious malfunction of the fuel system or emission control system. • Do not spill fuel on the exterior surfaces of the vehicle. Any type of fuel spilled on painted surfaces may damage the paint. • After refueling, make sure the fuel cap is installed securely to prevent fuel spillage in the event of an accident. An emergency fuel filler lid release is located in the luggage compartment, on the left side. 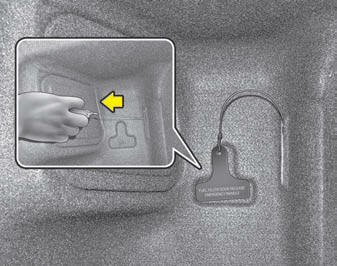 If the fuel filler lid does not open using the remote fuel filler lid release, you can open it manually. Pull the handle outward slightly. Do not pull the handle excessively, otherwise the luggage area trim or release handle may be damaged.